Act4Advisors Products - Allied Financial Services Inc. - Allied Financial Services Inc. Note: ACT! sold in US & Canada only. Online orders are available for US residents only. Canada sales please call 1.770.475.0495 x1 or email sales@software4advisors.com for purchasing assistance Monday – Friday 9AM – 6PM EDT. 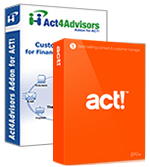 *Act4Advisors License Note: Each Act4Advisors license includes one Act4Advisors database that can be installed on one computer. The license level is based on the number of active users who have login rights to the database. License level’s include Single User, 2 User, 3-5 User, 6-10 User, etc. 4. Published minimum system requirements are based on single user environments. Actual scalability and number of networked users supported will vary based on hardware and size and uSwiftpage of your database. Swiftpage Software scalability recommendations are based on in-house performance tests using the recommended server system requirements found at: ACT! Requirements to ensure your system meets these requirements. You must have one license of ACT! per user. Customized ACT! for Financial Services Professionals. Note: Online orders are available for US residents only. Canada and International sales please call 1.770.475.0495 x1 or email sales@software4advisors.com for purchasing assistance Monday – Friday 9AM – 6PM EDT. Note: To purchase this, you must have purchased a previous version of Act4Advisors (Act4Advisors version 1 or 2). 1. 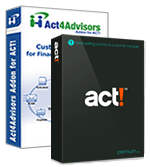 You must purchase one license of Act4Advisors Addon for ACT! per user. 2. Published minimum system requirements are based on single user environments. Actual scalability and number of networked users supported will vary based on hardware and size and uSwiftpage of your database. Swiftpage Software scalability recommendations are based on in-house performance tests using the recommended server system requirements found at: ACT! Requirements to ensure your system meets these requirements. You must have one license of ACT! per user. Note: ACT! Pro can only be used with up to 10 users sharing one database. If customer adds an 11th user or greater, ALL users must upgrade to ACT! Premium. The products and services highlighted on the softwar4advisors.com website have undergone a product review by Allied Financial Software, Inc. (AFS). AFS is a reseller of most products listed on this website and is in no way liable or responsible for claims made related to the products or services provided by third party vendors. AFS does not warrant or guarantee the quality of products or services provided by any vendor. Please direct your inquiries regarding softwar4advisors.com website product warranties to the appropriate vendor. Published minimum system requirements are based on single user environments. Actual scalability and number of networked users supported will vary based on hardware and size and uSwiftpage of your database. Swiftpage Software scalability recommendations are based on in-house performance tests using the recommended server system requirements found at www.act.com You must have one license of ACT! per user. **Note: ACT! Pro (standard version) allows 10 or fewer users. If you expect to have more than 10 users, you must purchase ACT! Premium. This version allows more than 10 users and gives you additional functionality. Click here for more a comparison of Swiftpage Pro to ACT! Premium. Addons for ACT! blend seamlessly with ACT! letting you customize ACT! to the way you do business. Click here for a complete list of Addons for ACT! With ACT! Email Connect for MS Outlook, you can start your Outlook email directly in ACT! and send email from Outlook or send and attach to ACT!. No ACT! email client or ACT! addressbook is needed. More Details | Order Here! Swiftpage gives you the tools to create beautiful email templates, send directly from your database and track your mesSwiftpages. You can also schedule to send, or choose to send as a different user or the record manager of each contact. Mondo Media provides ACT! 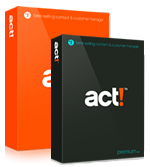 training videos that help sales professionals, information technology professionals and customer service staff get the most out of ACT! software. Sync your ACT! CRM data with all the latest Blackberry, Windows Mobile, iPhone and Palm OS devices, or with Microsoft Outlook. ACT! for Blackberry, Pocket PC, and Treo Smartphones! Simple, reliable and secure. Handheld Contact is the best solution for getting ACT! on your phone. Easy to use, interactive form system for the independent financial advisor. Laser App uses your broker, rep, and client data to assist you in filling out the tedious and redundant fields in securities and annuity forms. Scan, attach, and manage documents within ACT! and become paperless.